Magic Number 2, making fields show in mission statements. Bonus...this also fixes the mysterious 'Failed to load IDS xxxxxx' numbers! I have found a second Magic Number. I really hope it wasn't discovered yet. This discovery makes your new clouds/asteroid fields show up in the mission declarations. Most of you have probably heard of it (although most don't believe in it enough to apply it and end up with problems). It was 131834. Notice its entries go up in blocks of 100? Thats all you need to do, keep to the same format and the text will show up ok. The ids_name has to be within a set area of names_resources for it to work, so make sure it is just after the existing entries. In order to make space for yourself, you can move the ids_short_name for the original factions to a custom dll and use their places for new factions instead. The folks who don't follow the convention in that tutorial end up with all kinds of problems. Ships don't show up with the right markings, factions aren't named correctly in the rep list and bribes are totally whacked. Probably other places too. My observations of this through trial and error indicate that only 100 factions will work correctly in the above situations since the final jumps are in increments of 100. You can have more than 100 factions, but only the 100 you place in this range will work correctly. So move your player factions for rep edits and all non-base-owning npcs to other ranges, they will be fine. 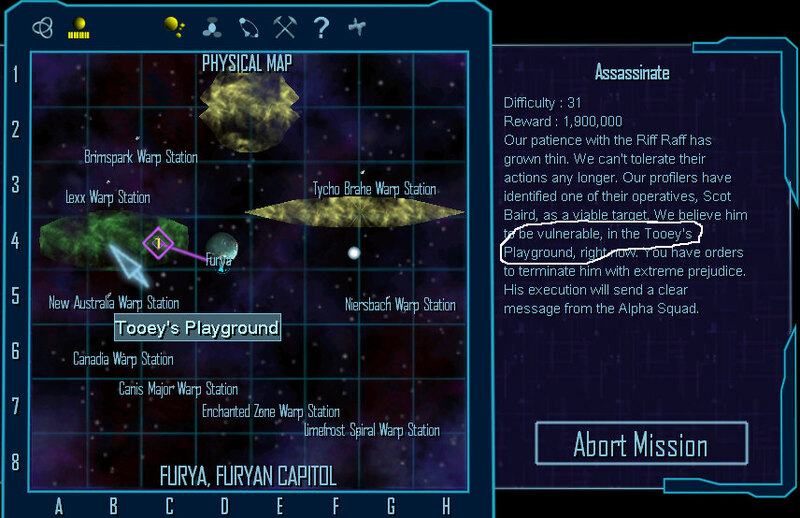 If I took this mission I could see the destination upon launch and it was indeed in a nebula or asteroid field. The mission type was set to field so this wasn't the problem. I had already placed all of my fields zones in the knowledgemap.ini so I started looking at the vanilla closely and noticed two things. 1) Only certain fields were declared in this file, not all of them. It became obvious why when I counted the vanilla asteroid and nebula entries (163 + 81 = 244). As explained below, there are only 200 slots available. If this was the correct procedure, then they should have only entered the fields that mission vignettes existed in. Vanilla only has 140 listed in the knowledgemap.ini. Notice that the second number is a jump of exactly 70473 in every vanilla entry. Each number after that is exactly 200. I was confused as to why they had 11 entries all the same but with different numbers. If you FLEd-ids these numbers, the last 8 are blank entries (not even a space, just blank) but they exist in the OfferBribeResources.dll. What were they for and why 11? Then I put my original ids number back in the first slot (from a custom dll). It no longer worked. Additionally, I got a new spew error, 'Failed to load IDS 532050. Guess what?! My original number was 461377. Add 70473 and 200 to it, you get 532050! This confirms how the game is looking for these entries. Then I added two additional new entries +70473 and +200, which made my 3 numbers 461377, 531850 and 532050. Ack, it didn't work! I re-added the 8 blank entries in increments of 200 in my custom dll. Still not working. So, this is the conclusion...even though the game was seeing my new custom dll number and adding to it to get the 532050, it still wasn't working. Final conclusion, your new field names MUST start in the original range (which is in NameResources.dll) and end in OfferBribeResources.dll. Modders with vanilla systems only have 60 left out of the 200. For me, I can overwrite all vanilla giving me the whole 200 range (the UnderVerse is a total conversion with no vanilla systems). I still don't know why there are 8 blank entries after these. Perhaps for something I haven't observed yet, perhaps they were for future expansion that DA never got around to. Since DA only provided a range of 200 entries but had 244 fields, they found it necessary to limit them. First by only listing those where vignettes entered the fields. The second by only listing the largest of similiar fields. For instance, a system with a system-wide field only needed to be listed that once since everything else was inside of it. An asteroid field with a slightly larger cloud surrounding it only listed the cloud since it included the asteroids inside of it. 'Failed to load IDS xxxxxx' numbers...these will pop up in any new system where you have a vignette inside of a field and someone takes a mission that picks that spot until you apply the above tutorial. Well done, I think Will have to read a few times more lol. I am always willing to make more work for others, hehe. The 'open' and 'field' are for something else. Supposedly (heh) if you put 'field', then the mission auto-generation will skip any mission with a structure, like 'destroy a base'. This is so you don't have to make passes at bases and weapon platforms while dodging asteroids. That's good to know as well. I'm impressed with this discovery as it's a problem most mods suffer from but is also easily fixed now. Excuse the gravedig on this. Working on a vanilla based mod, so far added in two new asteroid fields that have missions in them. Applied the info in this excellent tutorial and it still won't show the the asteroid field names. Now i know this all works in my other TC mod, so it's not the information that's wrong. I'm stumped tbh. That looks correct. How is it not 'showing correctly"? Is your vig totally inside a declared field or only partly inside it? Is it showing a grid entry instead? 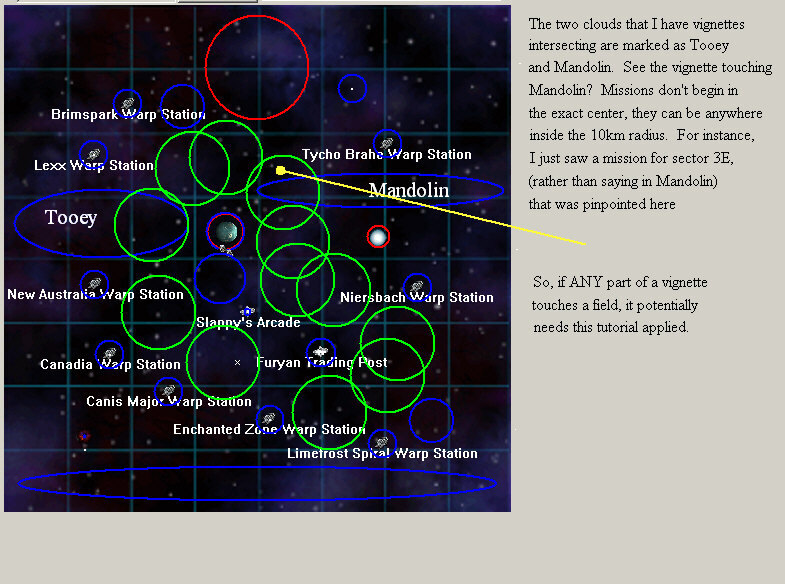 The placement of the mission waypoint is random inside the vig, so if not fully inside it could be 'outside' the cloud. Problem solved, i'm just getting old and stupid. After reading this tutorial over and over the solution hit me after a nights sleep and my second cup of tea. I've been using a custom dll to store the IDS name of the zone. WRONG. As mentioned in the tutorial, for this to work you must use the original range of numbers, 261208 - 261407. Now i'd been adding it all correctly in KnowledgeMap, and using the correct range, in my case 261352 plus associated entries. Turns out i forgot something and this was the actual solution, i need to change the IDS name number in the system ini file to match the IDS entry in KnowledgeMap so renaming the asteroid field name entry in my system ini file to 261352 fixed it. They all show up exactly as they should. Just like to add the IDS info section can stay in a custom dll as it has no bearing on the missions showing up. Might already have been mentioned. What you guys are talking about all seems to make sence , just wish i could understand it all , But at least i can enjoy the Mods you guys Create , Great Work , Thanks .